I rarely put the word “vegan” into a recipe because that would get tedious. But the reason I’m using it now is that I want to stress that this is a classic vegan Caesar. Not a classic Caesar, but a salad that vegans have been making for as far back as, I don’t know, the 1980s? The legend goes that some vegan awoke from a long VCR’ed Dynasty marathon, with a yearning for garlic and nutritional yeast… and the vegan Caesar was born. When translating a Caesar salad, you want to capture the tanginess, the creaminess, the umami and the garlickyness. 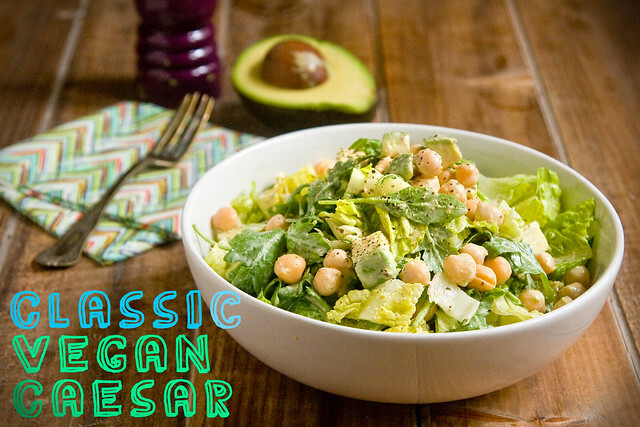 Vegan versions are all over the map, I’ve even published several kinds of Caesar, but this one is three things that cooks love to hear: quick, easy and simple! The tahini is the creamy base, lending also an irresistible nuttiness. Nutritional yeast and dijon mustard provide the umami tang, and if your mustard is whole grain you get some texture, too. And then there’s garlic! This dressing is kept easy so that there’s no need to break out the blender, just a coffee mug and a fork will do. Use my tip below for a very lazy method of garlic prepping. As for accoutrement, well, avocado and chickpeas are certainly my go to. But you can do it up in a gazillion different ways. 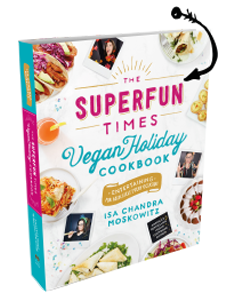 Here are some of my favorite additions: toasted pine nuts, capers, olives, a handful of cooked quinoa, sliced baked tofu (from a package is fine), sliced warm Chickpea Cutlets (or any chicken-y thing), garlicky sourdough croutons, vegan bacon, (deep breath…ok, proceed), tempeh (Chimichurri or Garlicky Thyme), grilled seitan, grilled asparagus, grilled portobello, roasted squash. See? It’s really fun and versatile. And it will get you totally excited about salad! So crimp your hair, protest Reagan and get ready for some classic vegan deliciousness. ~ If you’re feeling super lazy about peeling garlic, here’s a trick: Grate it on a microplane, with the skin still on. The skin should stay on top of the grater and fall away. You won’t be able to grate the whole clove, but hey, all in the name of laziness! Just be sure not to start at the nub side (you know, that rough spot at the top of the clove) since it’s too rough to grate. ~ And another garlic thing: You don’t have to waste time measuring garlic into a teaspoon, just eyeball it. Since this dressing comes together in a snap, you can adjust to your tastes very easily. Stir together the dressing ingredients in a small bowl, or a coffee mug. Use a fork to blend smooth. Add additional tablespoons of water to thin, as needed. Taste for salt and seasoning. It should be slightly salty, because the saltiness will subside when you dress the salad. In a large mixing bowl, toss the greens with the dressing. Add the avocado and chickpeas. Serve with fresh black pepper sprinkled on top. Sounds delish, thank you! I’m going to make this up this weekend – I’ve been needing to mix up my salad dressing routine. I ALWAYS have that seizing problem with tahini, with both water and lemon juice, but you’re right in that it goes smooth again with more mixing. I’ve been using tahini for years and years, from all kinds of different brands, and it always does this to me. Who knows why?! I never had tahini NOT curdle when I start adding water. I always thought it was because oil (or in this case the fat in the tahini) and water don’t mix easily. Yes, that’s definitely a good reason. It’s just so weird how it happens with tahini and not so much with almond butter or other butters. And it’s so weird how it just fixes itself, too! I’m allergic to sesame seed so I’ve never worked with tahini. I usually replace sesame with things like sunflower seed. So I’m hoping to get by using sunflower butter. BUT I was wondering how thick tahini tends to be. Should I be adding more water? For some reason I imagine tahini to be less thick than sunflower butter. I made this for lunch today because it was so easy that I already had the ingredients! I’m not a chickpea fan, so I threw edamame, tomatoes and avocados in there instead. So delicious! I’ve never had vegan caesar before and I was so impressed with how fantastic it was (and the garlic shredding trick was awesome too). Thanks!! I know exactly what you are talking about! I think it’s because the fat molecules absorb water to a certain extent and then get saturated so then it starts to smooth out. But that’s just my hypothesis. I am so excited to try a tahini-based caesar for those of us who can’t eat cashews! There IS a good, tofu-less vegan caesar! Love a good caesar salad! And yes, my tahini does that when I add water to it. Vigorous stirring fixes it right up. Tahini is a non-Newtonian fluid, so adding water (a Newtonian fluid) results curdled appearance until the two systems have a chance to fully combine. No, just kidding, I have no idea — it sounds like it could be right though! The Whole Foods near me has started carrying Beyond Meat chick’n and it’s pretty good. I bet the grilled version would be delicious in this. The Caesar dressing in Veganomicon is so delicious, so if this version is half as good, it’s going to be a staple in my summer dinner rotation. Thanks for sharing! Yeee harrr Isa. I have two ripe avocadoes that need using. And loadsa lettuce in my allotment. Sweet! I just might give this a whirl, to celebrate my crimped, anti Thatcher and Reagan days! Back then I had just discovered hummus and lived off hummus, pitta bread and salad pretty much. This yummy Caesar salad would have broken my hummus monotony… actually, retro food is an obsession of mine, especially UK 80s vegan- I just love all the wholemeal pastry and quiche and salad type things, and don’t even get me started about flapjacks…! Tahini, nooch, garlic, avocado, chickpeas! What’s not to like?! Some of the best ingredients all together in one bowl! Yum! I have loved all of your Caesar recipes so far and I’m sure I’ll love this too! Thank you! There is a Middle Eastern trick with tahini, particularly when using it in hummus: add half the amount of water you need to the tahini, and mix. It will be super thick and weird. Then, add the rest of the water. Mix again, and it will smooth out and get creamy and wonderful. I don’t know why or how, but people in the Middle East never use straight tahini, and this is how they prepare it before adding it to anything. Have you been peeking in my frig? Got it all…looks like dinner is all set for tomorrow, for tonight your amazing mac and cheese. Loved it by the way. Best sauce by far! Thank you. Thank you. Thank you! Any suggestions for replacing the mustard? I usually just leave it out, but it sounds like it’s a key ingredient in this recipe. Pic will not pin. I want to Keep this on my pinterest!!!! Simple yet amazing. Looks great. Going to try it out today. I think the whole tahini business is because it behaves like a thixotropic liquid. http://en.wikipedia.org/wiki/Thixotropic Ketchup and corn starch behave in similar ways. I just made this dressing and added the juice of one lemon. It is super delicious and is going to be a new staple in my fridge! This is going to be a summer staple–I love quick, unfussy salads. Thanks! This sounds so good! I haven’t had a tahini-based dressing in far too long. And who doesn’t want more reason to shove avocado into their mouth? delicious+simple=will use this often. thanks. Isa, thank you so much for all that you do. My husband looks up from his plate and says, “Is this an Isa recipe?”, and then I know he’ll be going back for thirds… AND that he’ll learn to make the recipe himself, so he can have it ALWAYS. :))) Can’t wait until some avo’s ripen to try this one out, looks like another dinnertime staple. Oh also – You’ve got me addicted to making mini-loaves! This is the summer of mini-loaves at our house, mini-loaves galore! Cheers from Nashville. That is so sweet! I try to make the recipe measurements easy to remember so that anyone can make them. And here’s to the miniloaf revolution! I’ve been craving caesar salad for the last few weeks. I’ll definitely be making this soon! You are a genius! I can’t wait to make this. Do you think I can I use vegenaise instead of tahini? Sure, but it would be quite a different dressing! I’d also cut down on the water in that case. Even easier way to peel garlic: place on a cutting board and smack it soundly with the broadside of a knife and the peel just releases…really! And, sort of on the same topic: if you keep your ginger root in the freezer, two good things happen: 1) it does not go bad; and 2) you can grate it on a microplane really fast and without any need to peel. YUM! i love good caesar salad, but haven’t found a good vegan substitute! thanks! I prefer salads with Penzey’s sandwich sprinkle and a drizzle of olive oil over because most dressings are off–too sweet, too sour, it’s always something. But this dressing? Holy guacamole! By far the best dressing I’ve ever tasted, vegan or not! Caesar salads were always my favorite back in my pre-vegan days and this dressing is better than all the rest. So easy to make and so very delicious! We did romaine, chickpeas, avocado, and Lightlife vegan bacon. Does this ‘2 tablespoons nutritional yeast flakes’ make a difference in the flavor of the dressing or can I skip it? I don’t have it and have no idea what I would use it for if I did get it. This salad looks lovely by the way. Curious to try it. I’m allergic to sesame, but I will be trying this with cashew nut butter, which is my favourite tahini substitute. Made the dressing last night for some kale I had on hand. It is AWESOME – and so easy to make. Already thinking of other uses for it, as it’s simply too delicious to reserve for just one salad. great recipes! I was wondering if i can include them on my new site about veganism, organic food, raw food, etc.. I can include you on the resources list then. Thank you for this recipe! I made it last night and we loved it. Just what I needed to get me out of my salad rut. I brought this to work today for my lunch. All my friends were admiring this salad, and everyone asked about the dressing–“Wow, is that Caeser? That smells amazing!” It was beautiful and delicious. Made this with cubed browned tofu, grilled corn and homemade croutons. Somehow my first vegan caesar in all my years as vegan! Killer, to say the least! didn’t really like this. Dressing tasted bitter, tried to fix it but still didn’t like it. Maybe it was my brand of tahini? It really needed something to smooth out the taste. I had this for dinner last night and it was delicious, so simple and perfect! Brought leftovers to work to have for lunch later today and already got comments from co-workers on how good it looks just sitting in the fridge. Thanks for another awesome recipe. This looks so tasty – my husband would especially love it! This exactly the kind of salad I was craving. I can’t wait to try yhis dressing! This is SO quick to whip up! I happened to have all of the ingredients in my fridge, needing to be used up, and I needed something for a light dinner. Perfect. So delicious. I’ll be making this regularly! Made this last night…..so good! I am not really a fan of Caesar salad but decided to whip this up for a quick dinner. I ended up really enjoying it, thanks for sharing! Can’t wait for the new book to arrive at my doorstep, already have it preordered. Just had this for lunch and it ruled. I’m going to make this dang dressing all the time now! I made this in a hurry to go with my parents “official” first vegan meal. It was whipped up in no time and they really enjoyed it. I didn’t tell them it was a vegan caesar and they didn’t pick up on it to the best of my knowledge. There was some taste reminiscent of it to me but I think we all just enjoyed the salad for what it was, delightful! My mom even said, Yeah, it’s good, but it had to be time consuming to make and was very surprised when I told her how simple it was and curious about the ingredients in it. Thanks So much for your lovely recipe and for sharing your creations with everyone! That is so nice to hear, thank you! Thanks so much for this! I am part of a CSA and have a steady stream of fresh greens all summer, and the old olive oil and vinegar gets a little old after awhile. I’m excited to mix it up with this! Thanks, Isa! In an attempt to save money, I made my own tahini, which may have been why my dressing was less awesome than anticipated (I think I over-toasted the seeds… oops). However, I added more crap to it, namely lemon juice, more garlic, more pepper and a dash of Braggs and olive brine. Within minutes, it was ultra yummy! I halved the batch as it’s just me (hence the hesitation to buy a big thing of tahini), and I still have enough for one more caesar. Yum!! PS As fledgling vegan, I am soooo blown away by the power of nooch! 🙂 Amazing stuff! I made this tonight with tempeh bacon and it was delicious! I modified the dressing just a touch, adding about a teaspoon of lemon juice to give it a little more acidity. I also used a spicy dijon mustard to give it a little kick. It all came together nicely–it made for a tasty summer meal! Awesome! I was wondering what to do with all the Romaine in my garden! The tahini-freeze thing is actually due to temperature (tahini reacts really quickly to cold temps). If you add lukewarm water instead of cool or cold water it should all stay liquidy. I made this salad tonight, with crunchy seitan dipped in whole wheat & sauteed in olive oil (like in seitan piccata), then more of this scrumptious dressing on the seitan. So yummy. Your recipes can get me excited about making dinner even in this heat! This was my first vegan ceasar dressing and I was super excited to try it! Mine came out tasting extremely bitter, is that to be expected? I poured it over a salad with avocado, onion, and Jamaican jerk tempeh so the bitterness wasn’t overwhelming, but I’m not looking forward to packing it for lunch 🙁 maybe I used too much tahini — any suggestions? Using tahini for Caesar dressing is so genius! Looking forward to making this, maybe with some chickpea cutlets! Delicious! Made this 2 times in 1 week! loved it that much. Only thing we do different is roast the chickpeas with olive oil and cajun seasoning. In case your interested, just toss the chickpeas and seasonings together and bake for 20 minutes @ 425 degrees. I love how you say to mix things in a coffee mug. Totally!!! LOVE IT! I’ve made this dressing 3 times already! (But I haven’t done the full combo, yet). I love the Caesar dressing recipe from Appetite for Reduction, too, but this one is way faster to make! This looks and sounds amazing! I’m with Anna (June 10th comment) in wondering if the yeast flakes can be skipped – or substituted with something else? I can’t get those where I am. Looking forward to trying this! It’s really good for thickening, but you could leave it out and do a little extra tahini. Hey Isa! How long does this dressing stay good for? Thanks! I’ve had it for 5 days or so. This dressing was delicious!!!! I love all of your dressings, especially your oil-free ones are always a home run. Thanks for sharing them. Delicious!! We had tons of kale so I used that instead of arugula and romaine. Made it kind of bitter but I counteracted with more nootch and mustard and was satisfied with the results. Boyfriend added kalamata olives and pepperoncini. Also, my dressing turned out too thin so I blended in another avocado. Thank you Isa!!!! Just made this salad tonight for my family who are meat eaters who laugh at my vegetarian food. I have been craving so badly a Cesar salad, and this was so perfect! My mom and dad both were surprisingly loving the salad. My mom even asked for second helpings! My grandma got me your Veganomican for Christmas and now I am bound and determined to start cooking and make as many meals I can out of it! Thank you so much Isa! Please keep up your great work! What are yeast flakes? Can you make this without? I’m allergic to brewer’s yeast and baker’s yeast… doe yeast flakes come from either of those? I love this dressing! 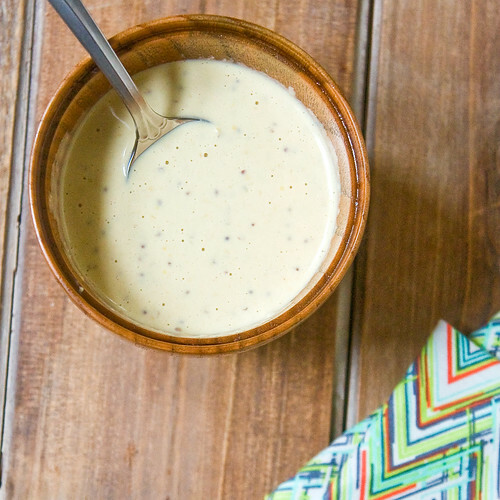 I was addicted to the caesar chavez dressing from Appetite for Reduction, and I thought I could never love another caesar dressing as much, but I was wrong…This dressing is so easy to whip up. I make a double amount and keep it in a jar in the fridge. I use it as dressing on salad but also dip for veggies or pita chips. I even like to put it on sandwiches. I always add black pepper and lemon juice when I make it to give it some extra zing. This Caesar is a favorite in my house, we’ve eaten it for about a week now & haven’t tired of it yet. Tonight I’m going to make your Ranch salad. You’re a very talented chef & we’re reaping the benefits, thanks! Being Vegan never tasted so good! I’m obsessed with this salad dressing. Who the hell needs ranch? Or dairy caesar? Damn this is good. I wish I’d known about it earlier in life. Thanks, Isa! Have any of you guys actually put the arugula in the salad? I have literally EVERYTHING else just sitting around — except for the arugala! Wondering if I should throw in some spinach, or just leave it entirely romaine. I see how arugula could add some nice bite to the Caesar, but spinach might be too…. spinachy. I’m a lousy (and lazy) vegan cook, but I love Caesar salad and creamy vegan dressings. “No need to break out the blender” got me interested at once. I had all the ingredients at home – so good. Thank you for this recipe. Thank you for this great recipe and making it OIL FREE!! I love you for that. For those who may want to have vegan Caesar Salad, try Beyond Meat. their ‘chicken’ strips are fabulous and vegan. I have been making a vegan Caesar with Beyond Meat lightly seasoned strips, croutons, capers, romaine and this dressing. It’s a staple in our house. Thanks so much for the dressing recipe. it is amazing! I just discovered your site and LOVE IT! I feel like it’s Christmas all over again. Thanks! Every time I see that picture, I say, Mmm, I have to go eat salad. Really great Caesar dressing recipe. I made a couple of small adjustments: I used vegetable broth instead of water and I added a couple of tablespoons of lemon juice. I also cut the romaine heads in half, drizzled them with oil, lemon juice and salt and pepper and then grilled them on the stove top for a couple of minutes on the cut side. I then drizzled the dressing on top. Delish! Has anyone tried to make extra dressing and bottle it? How long do you think it would keep for? The very best caesar salad dressing I’ve ever tasted, and I’m not vegan… my daughter and husband are and they introduced me to this. It’s AWESOME goodness!! Yum. I added some capers, a little caper juice and fresh lemon juice to the dressing, and I used white beans instead of chickpeas. So good, tastes just like Caesar!! Another tip: make the dressing in a jar. Just throw everything in and shake it up. Makes it super easy to mix and you can store extra in the fridge.. Being a Nutrititarian, I used this recipe and added a fresh squeezed lemon, a teaspoon of Braggs Liquid Aminos, two teaspoons of red wine vinegar, and a half teaspoon of Mrs Dash no salt. Did not add any salt. An excellent tasting dressing!! BLT Salad with Eggplant Bacon « giant friday | nourishing food for good times. Vegan Caesar salad | Wat eet je dan wel? Does the dressing keep for a bit? Can i make it a day in advance? I used an immersion blender in mason jar and had no issue with weirdness between water and tahini. Went with full amount of Nooch and wasn’t dissatisfied. To thin it a bit I used lemon juice and I think that adds an extra sparkle. Thanks Isa! This dressing is amazing thank you! I double the ingredients and blend it in my Blendtec which makes it extra creamy. Lovely textures but the dressing begs for more acid. I tried adding some lemon juice and might add a shot of balsamic or vegan worchestire (is there such a thing?). Thank you again. One of our favourites in Studio SHIM 🙂 I’ve doubled the sauce many of times. Grating fresh garlic is different than pushing it through a garlic press? But can I press instead of grate? Does grating impart some secret benefit?